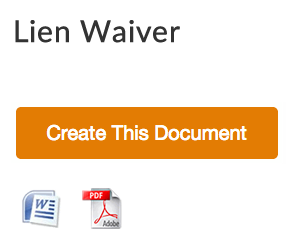 To download the free lien waiver Template in PDF format, please click Lien Waiver Form in the bottom. The contractor has fully paid for all said materials, labor, tools, equipment, construction facilities and everything of every sort furnished by it, or by its subcontractors or material men, upon said premises and furnished therefore for said work. The current amount due from PS, and unpaid to Contractor, is the sum of $______________, and upon payment to the Contractor of said sum, Contractor hereby waives all liens and claims against PS, its premises and property for said sum, and further, Contractor represents that no other person or party has right to a lien on account of any work performed for, or material furnished to Contractor for said work. BEFORE ME, the undersigned authority, on this day personally appeared ____________________ known to me to be the person whose name is subscribed to the foregoing instrument and acknowledged to me that he executed the same for purposes and consideration therein expressed, GIVEN under my hand and seal of office, this _____ of ______________, 20___. To download the lien waiver template, please click Lien Waiver Template.